We published hundreds of blogs during this year of transition, emerging on the other side as a united Nokia and clearly united around the topics that are driving this industry. In our Top 10 most-read round-up, blogs by Nokia CEO Rajeev Suri in his dual role as Commissioner at the Broadband Commission was our top read author with his calls to action on how to harness the power of technology in order to enable the achievement of the UN’s Sustainable Development Goals, including the need to achieve gender balance in the ICT industry. Otherwise 5G stole the blog spotlight – from concrete customer cases and launch plans to cool 5G demos and resource publications – demonstration that Nokia is clearly committed to leading in 5G. 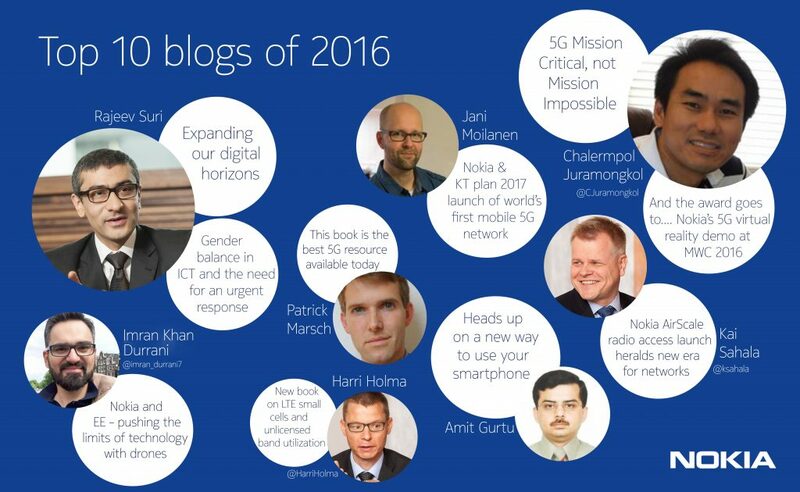 So, in case you missed them the first time around, here are our some of our most popular Nokia blogs from 2016 plus a few editor’s picks. We opted for the typical measure of popularity based on how many times a post has been viewed. Editor’s picks Here are some of our favorites from 2016. Blogs that expressed how innovation can truly expand the human possibilities of the connected world grabbed our attention this year - from learning how 5G and virtual reality will impact healthcare in very tangible ways to exciting developments in public safety. The hidden depth of Virtual RealityA healthy birth for the 5G hospitalPower of innovation to save livesWhich enterprises will be first to leap through the IoT looking glass? On behalf of our Nokia bloggers, thank you for your interest this year. We will continue to cut through the hype and keep things real by drawing on operator examples and sharing important milestones and roadmaps. Want to help us stay topical? Please share your thoughts below on what you’d like to read more about. Sending you a warm Season’s Greetings and welcome back to this space in 2017. As managing editor of Nokia’s global blog channel, Heather supports bloggers near and far, in addition to any creative endeavor that helps make tech human and approachable. When she’s not busy ensuring that readers have direct access to our networks experts and executives, she’s on the lookout for guest bloggers. Interested? Tweet her @rosssiro or email: heather.ross-sirola@nokia.com.